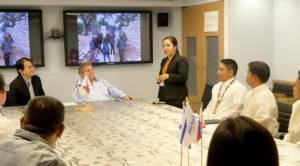 A delegation of educators from the city of Davao, the Philippines, arrived in Israel to learn about innovative interdisciplinary programs developed by the Sci Tech Israel R&D Center, initiated by the Israeli Ambassador to the Philippines Dr. Effi Ben Matityahu and the president of the PassItForward foundation Mr. Shmuel Weiss. 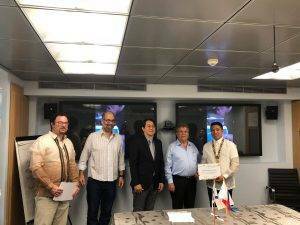 The two Sci Tech staff members, Mr. David Rosenberg and Mr. Sagi Ben-Bassat, were invited to visit the Philippines in order to assess the potential for cooperation in the field of innovative scientific and technological education. 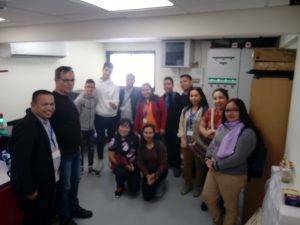 The initiative received a boost of encouragement with the visit of the President of the Philippines and his home, the mayor of Davao, Mrs. Sara Duterte-Carpio – in Israel, during which she visited the Sci Tech Ma’aleh Adumim. 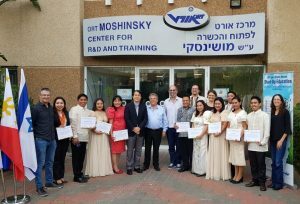 The delegation, comprised of two principals and eight senior teachers, participated during its two-week visit to a unique course of the Sci Tech Israel network on innovation in education, to be held at the Sci Tech Israel Moshinsky Center for Research and Development and Training. 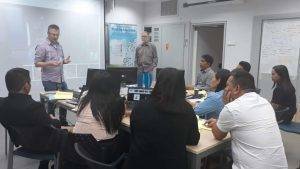 The course focused on interdisciplinary study programs developed by the Sci Tech Israel Center for R&D and Training: iSTEAM, Neuro-Sciences, Heart of the Matter and Sci Tech MAKERS. 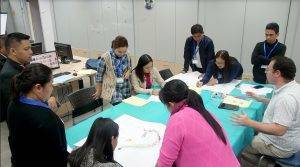 The course emphasizes innovative learning methodologies, including on-line and mobile learning, as well as ‘soft’ skills in team work, learning and peer assessment. 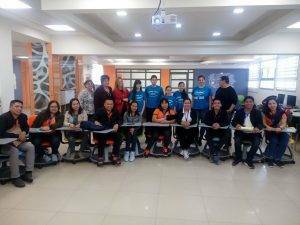 During their stay, the delegation visited Sci Tech schools in order to examine the facilities of advanced learning, to receive an overview and experience of the innovative learning programs and above all to meet the teachers and students who teach and study in these facilities and these programs. 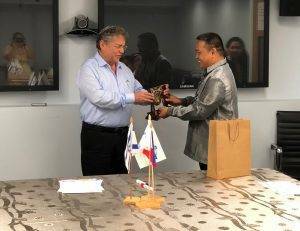 At the end of the visit, the Philippine Ambassador to Israel, Ambassador Imperial, thanked Sci Tech ‘s partners for the course and emphasized the importance of science and technology for the development of the Philippines. 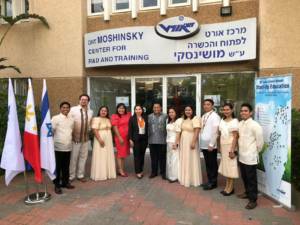 He also mentioned the visit of the President of the Philippines, Rodrigo Duterte, to Israel last September, during which this subject was emphasized. 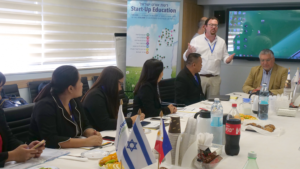 Zvika Peleg, CEO of Sci Tech Israel, emphasized the importance of science and technology studies to ensure the welfare and personal development of students in Israel and in the Philippines and by that to improve the society as a whole. 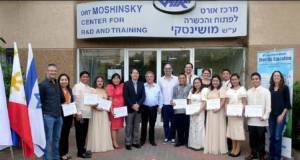 The opening ceremony of the course took place in the presence of former Israeli Ambassador to Manila and senior Sci Tech officials. 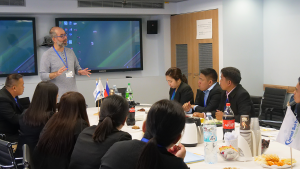 The course program was presented to the delegation members, and the Israeli education system was reviewed in general terms. 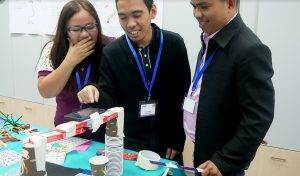 A delegation of educators from the Philippines had reverse-engineered headphones and reshaped them in different styles as part of an interdisciplinary learning exercise that combines engineering, science and art. 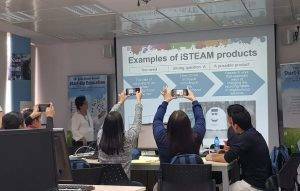 During the day they reviewed and experimented with the pedagogical tools of the Sci Tech Israel network’s iSTEAM program. 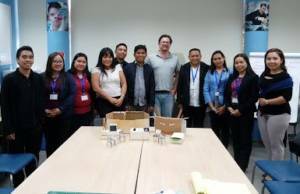 The delegation of educators from the Philippines had experienced an analogy workshop in science and engineering with Yair Ben-Horin, one of the methodologies underlying the scientific engineering track. In the Makers Workshop with David Rosenberg, they experimented with tinkering learning to discover the possibilities inherent in a vibration engine. 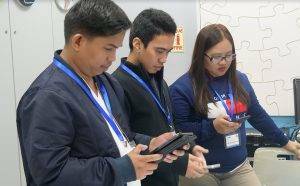 In a mobile learning workshop with Nili Mozes-Bloch and David Rosenberg, they experimented with using the smartphone as a learning tool, research and scientific experience in class (and beyond). 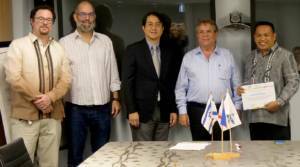 The delegation visited Sci Tech Greenberg Tivo’n and Sci Tech Kiryat Motzkin. At Sci Tech Tivon they had received an in-depth review by Mr. Assaf Chertoff about the interdisciplinary programs in engineering and science and the unique Sci Tech Tivon complex, which includes workshops that are also open to the public. 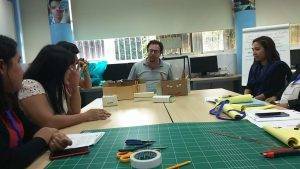 At Sci Tech Kiryat Motzkin, 9th graders from the scientific leadership class presented their activities and 12th graders presented interdisciplinary projects that combine electronics, design and programming, and then toured the old city of Acre. 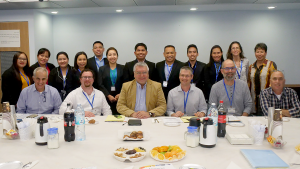 The members of the delegation experimented with selected workshops developed by the Sci Tech R&D Center: The program was given by David Rosenberg of the R&D team and they heard why the periscope has two sides and simulated a CT imaging system using a cardboard box and bamboo skewers. 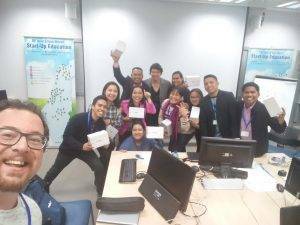 In a workshop with Dr. Moshe Talesnik, head of the curriculum and pedagogy unit, they experimented with different levels of gamification. 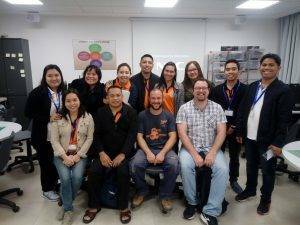 Dr. Nira Shimoni-Ayal of the R&D team had given a series of workshops and experiences from the neuroscience program. 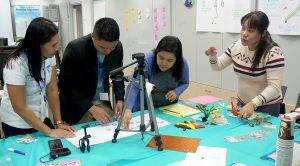 The delegation opened the day with Mrs. Mira Sa’ad and Mr. Yair Ben-Horin in a philosophical inquiry workshop. Analysis of arguments and a dive into the roots of ideas while giving time for contemplation, what is known and unknown, listening and reexamining what was understood and what was not understood. Later Mr. Sagi Ben-Bassat presented the subject of biomimicry and how to observe nature and learn about technological solutions created by millions of years of evolution. Later in the day they visited Sci Tech Modi’in school. 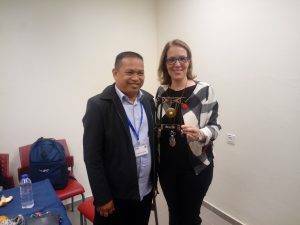 Mrs. Galit Goldenberger, the principal of the school, the teachers and especially the students, presented the scientific engineering track, electronics and robotics, and in particular the unique model in which senior students guide younger students in projects in robotics. 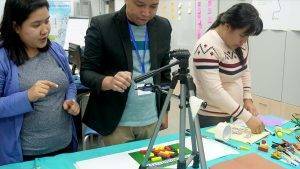 At the Makers Workshop, the delegation built scaled models based on drawing as a tool for developing 3D perception and measuring skills. Later they dismantled packaging and designed new packaging as a tool for 3D perception and packing functionality. Mrs. Tamar Meshulam also gave an overview of the skills acquired in the Sci Tech Makers course. After lunch they broke into the safe! 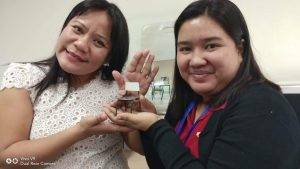 Based on the knowledge and experiences of the course, an experiential summary activity with Dr. Moshe Talesnik, a series of assignments were given and the first to complete could try to open a combination lock based on their answers. 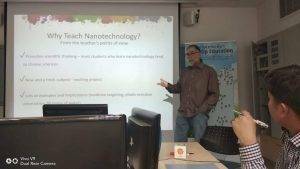 Later, Dr. Yossi Baumaker of Sci Tech Ebbin presented the curriculum of nanotechnology and demonstrated how he teaches his students this subject. 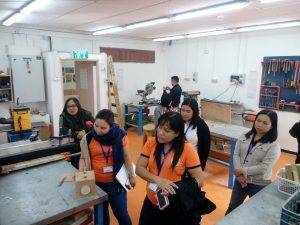 Today the delegation visited Kfar Galim, an educational village, where Mr. Udi Ram mentors his students in research projects that are at the forefront of precision agriculture. 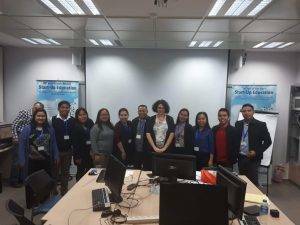 The students presented the members of the delegation with advanced data collection and processing, which will be the future of agriculture in Israel and around the world. 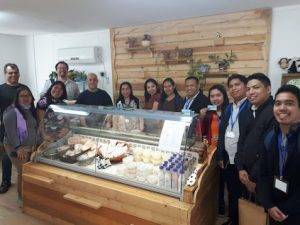 They also visited the Makers workshop and at the cheese making shop where the students learn while experimenting with creative skills in wood, 3D printers and dairy products. 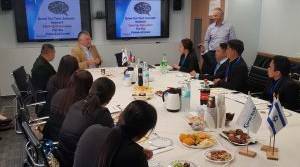 They then visited Webster-Biosense, one of the leading biotech companies in the world, where they learned about the company’s story as a representative of the Israeli high-tech industry, as well as the unique collaboration between Webster-Biosense and Sci Tech Israel. The day ended with a visit to Nazareth and a lookout at the Jezreel Valley from Mount Precipice. The members of the delegation opened the day in a workshop planning a future learning space and the pedagogical scheme utilizing it. 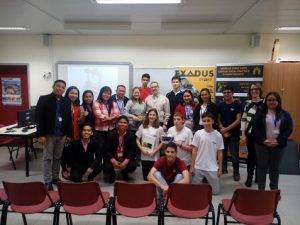 They then met with Mrs. Yael Barak from the Sci Tech -NFTE project, a successful project in Sci Tech. 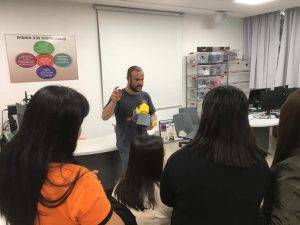 During the meeting they participated in a demonstration workshop and received an overview of the implementation of the project at Sci Tech Israel. 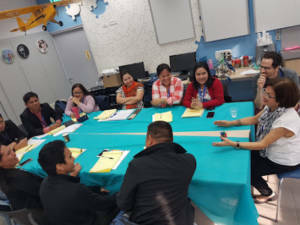 Later in the day they met to summarize the course and to interact with the Sci Tech team. 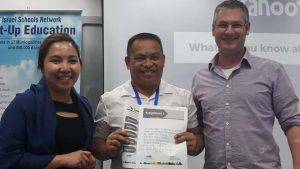 The CEO of the Sci Tech Israel network and the Philippine Ambassador to Israel will join the graduation and certification ceremony later.